What a fun-filled action display for your Yard! Santa and Rudolph will ride for hours at a time, legs pushing off, arms waving. Watch our action video below! Full-size patterns plus instructions to make both figures and the pine tree centerpiece. 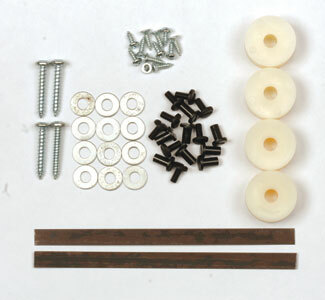 Requires Teetering Character Parts Kit sold separately below (up to 41" tall, head to toe). Our most fun and adaptable animated display to date! The endless action of our jointed characters riding this motorized teeter totter is both comical and mesmerizing! 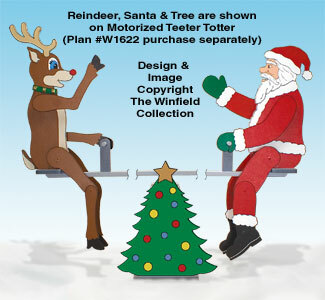 Build our basic Teeter Totter unit from these plans then make your favorite interchangeable characters (plans sold separately) to match the holiday or season. 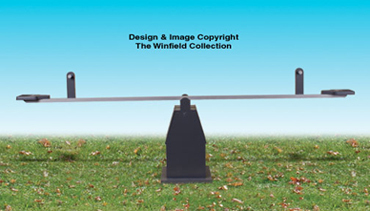 Plans include full-size patterns and complete instructions to make our basic Teeter Totter unit from standard lumber and plywood. 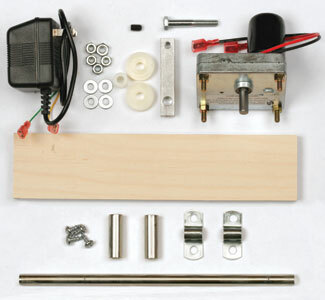 Requires our Teeter Totter Parts Kit and Motor Kit sold separately below. Patterns for Characters and centerpieces not included. (74" long x 18" tall)FOR DISPLAY ONLY!